Christmas time visitors to Walt Disney World will find a festive new version of the classic Jungle Cruise ride, now dubbed the Jingle Cruise for a limited time. Its skippers have been armed with new jokes that fit the spirit of the season, ready to spread Christmas across the Congo River. But little else has been added to the attraction to form a full-fledged holiday overlay. 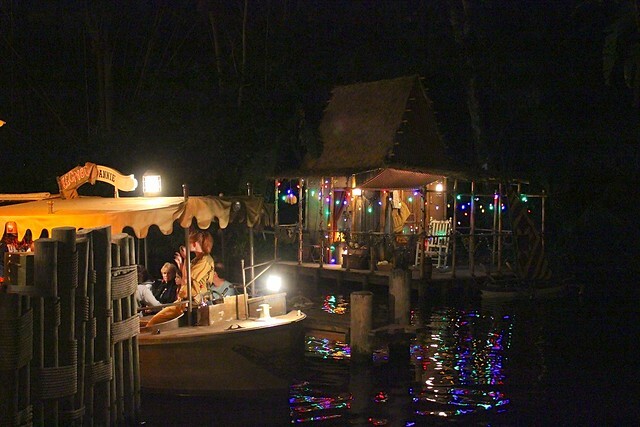 Instead, the Jingle Cruise is merely a minor update to the ride, adding a few Christmas details in the queue, renaming the boats, and giving skippers some new lines to work with. 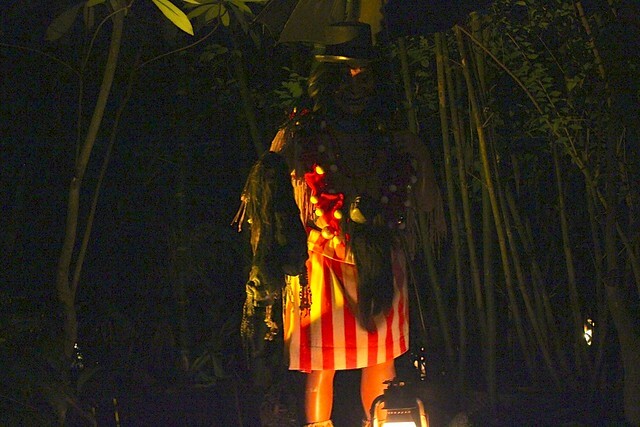 The ride itself is largely untouched, other than some colored lights at the beginning and Trader Sam donning colorful new attire at the end. With expectations properly set, the Jingle Cruise can be an enjoyable variation of the traditional trip down the jungle river. See for yourself in the video below. The Jingle Cruise has its moments of fun detail. The skippers’ Christmas lists in the queue shouldn’t be missed, asking Santa for “vacation time to somewhere civilized” and a baby hippo. And the music and announcements playing over the speakers in the queue are worth paying attention to, updated too. But sadly the details stop there, leaving only new jokes to continue the theme throughout the ride. It’s not nearly the holiday overlay it could (or should) have been, but it’s still an entertaining addition to the Christmas season at the Magic Kingdom. When asked why bigger attraction holiday overlays like Haunted Mansion Holiday don’t come to Florida, Disney’s response is always that there are more locals in California who appreciate the updates, giving them reasons to return to the parks throughout the year. While in Florida, Walt Disney World guests are mostly tourists who, according to Disney, want the traditional version of attractions, not a souped up Christmas version. 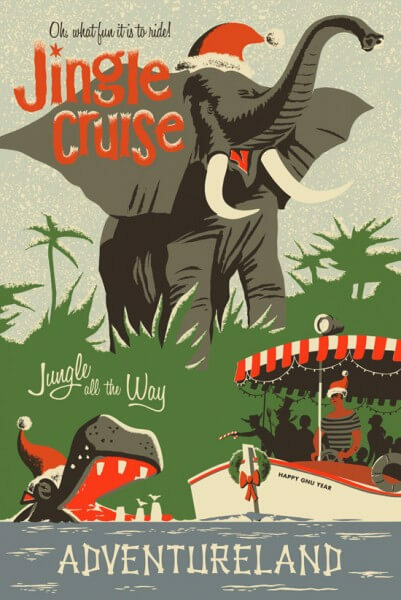 So in this case, Walt Disney World visitors looking for the classic Jungle Cruise experience still essentially get it with a holiday twist, perhaps the exact balance Disney was going for. The Jingle Cruise will also debut at Disneyland in California on November 12. I’ll laugh if Disneylands version ends up being better because the crowd out there are use to good overlays as it is. Disneyland regulars will spit this right back out and tear it a new one if it is the same out there as it is in Florida. I agree Dustin. I am a west coaster and have been to DL several times during the holidays. Although I have been to WDW many times, I went in December last year for my first holiday visit. I was a bit disappointed. There really is no comparison, and I hope that WDW is able to get to the fantastic level that DL does for holiday make-overs. East coasters deserve it! I suppose giving the actual elephants in the ride might’ve been too much for some. Oh well. It still looks very fun. And Disney’s statement to the difference in how the resorts treat holiday overlays might just be PR-fed response, but there could also be some truth to it. I remember last time I was at Disneyland, one of the castmembers who’d worked at both resorts made a similar remark that Disneyland was mostly visited by pass-holders while Disney World was more of a “once in a lifetime” thing for most people. I once heard from a cast member that the majority of people at WDW on any given day are first-time visitors. I wish I could remember the percentage I was told. I do remember it was much higher than 50%. That’s actually not entirely true anymore. 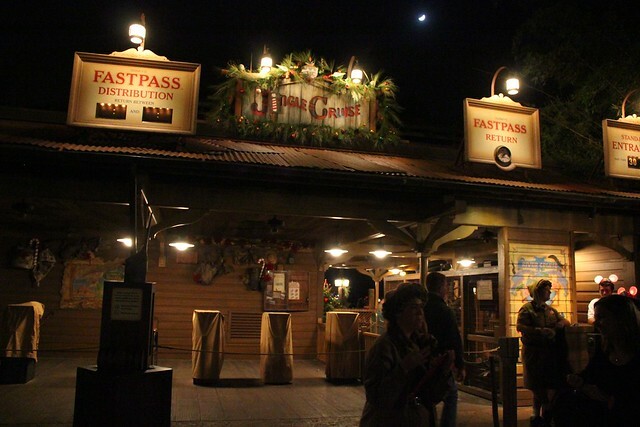 Besides, most guests would not complain if Jungle Cruise or Country Bears were different from their normal versions. Plus, CBJ in particular is not exactly a “headliner” attraction, so there wouldn’t be complaints from once-in-a-lifetime visitors over that show being different and not the normal version. The other overlays hew to the interior logic of the attractions. Singing bears might well decide to do holiday numbers. The Haunted Mansion is a perfectly rational place for Jack Skellington to take another try at Christmas. And Small World is already two thirds of the way to a Christmas card already. I’m of the same attitude….animatronic or not, it just wouldn’t make any sense at all to decorate the actual jungle itself. Keeping the decor limited to the dock and boats is exactly how it should be done. The only real exception I could see would be if the monkeys in the temple had broken into a crate labeled “decorations” and randomly threw them around. Maybe next year, some Bing Crosby 40’s-era Christmas carols playing in the background on the boats could be added. Then just pass the overlay then. When it looks as though more effort (and money) was spent on the overlay’s signage and promotional material than changes to the attraction itself, you know guest expectations are not going to be met. Maybe the jungle Cruise was not the proper attraction to place this effort. Personally, I feel this effort is a bit embarrassing. This concept must have come from a board room full of suits somewhere, not from an Imagineering round table. Wow that was under whelming. Same old thing just with a few christmas references from the skipper. I am a Skipper on the Jungle Cruise (now Jingle Cruise)at WDW. I have to say that as a Cast Member working on the attraction, I am happy with the holiday overlay and am happy that it is not a complete makeover. 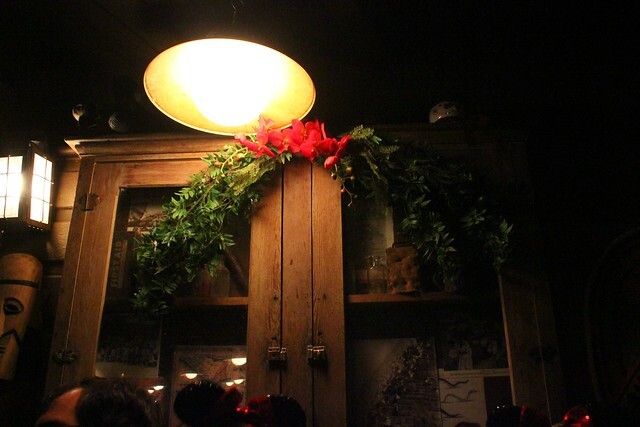 Yes, it would be cute to have the attraction revamped for the holidays, but yes it is true that the great majority of our guests that vist plan for years to come once in a lifetime with their families and what they expect is the traditonal attraction. We do as much as we can to deliver just that. 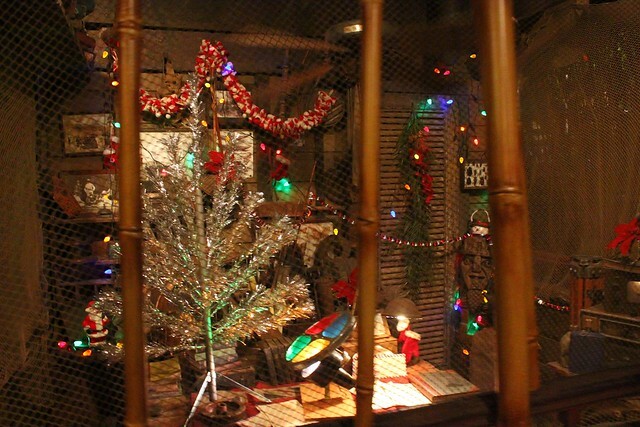 Jingle Cruise has a good balance of ‘traditonal” speil as well as the holiday jokes added in for those who visit once in a lifetime, or once a year. I believe that this being the first year of this additon to the ride, more will be added in the future to enhance the experience for the holidays. This will please the first timers as well as the 100th timers.